Timmy Hill picked up the 3rd last-place finish of his NASCAR Sprint Cup Series career in Sunday’s Pure Michigan 400 at the Michigan International Speedway when his unsponsored #98 Premium Motorsports Chevrolet was parked due to a recurring oil leak after he completed 9 of the race’s 200 laps. The finish was Hill’s first of the 2015 season and his first in a Cup race since last September at Dover, 30 races ago. Michigan was Hill’s fifth Cup start of the season, all of them coming for Jay Robinson’s Premium Motorsports. 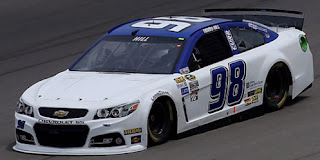 Hill joined the team at Loudon as the substitute for the departing Josh Wise, who disagreed with plans for the future of the #98 team after Robinson acquired it from Phil Parsons. Hill would be teamed with Reed Sorenson, who was also a replacement driver following Brendan Gaughan’s departure from Premium’s #62 after Daytona two weeks before. Hill finished 38th in his Ford at Loudon, eight laps down, while Sorenson failed to qualify the #62 Chevrolet. Sorenson missed the show again at Indianapolis, but Hill snagged the 42nd starting spot only to crash in practice, then in the backup break an axle coming to the green and spend the first 42 laps in the garage area. Sorenson and Hill swapped rides the next week at Pocono, where that week’s short entry list allowed both cars to start and come home 34th and 36th. At Watkins Glen, however, T.J. Bell couldn’t get the #62 into the show while Hill could only manage a 38th-place finish in the team’s other Chevrolet. At Michigan, Premium brought a Ford to the track for the first time since Indianapolis, but once again Sorenson couldn’t get the #62 into the show. Hill squeaked his way in to the 43rd starting spot with an average speed of 183.043 mph. Hill was 42nd in the opening practice, 43rd and slowest in Saturday’s second session, and did not participate in Happy Hour. On Sunday, Hill’s troubles began the very moment the cars rolled off of pit road. Reports indicate the oil pump on his Chevrolet cracked right along the weld, causing the car to hemorrhage oil along the apron between Turns 1 and 2. Hill pulled behind the wall as the field continued under the pace car for crews to dust the track with absorbent, and he was still there when the field took the green flag. As at Indy, the Premium Motorsports crew managed to make repairs and Hill made it onto the track on Lap 7. The efforts kept Hill from becoming the first driver to finish last in a Cup points race due to a “did not start” since September 5, 1993, when Bob Schacht’s #85 Burger King Ford fielded by the late Thee Dixon had mechanical issues during the pace laps of the Mountain Dew Southern 500 at Darlington. Just three laps after Hill returned to the track, however, the caution flew for a large piece of debris near the entrance to Turn 3. Replays revealed that the debris was an oil drain pan the crew mistakenly left beneath the car. Still fighting to make it to the competition caution on Lap 20, Hill started leaking oil again and was black flagged on Lap 14, sending him to the garage with just 3 laps completed in the event. This time, the repairs took much longer, costing him more than 50 laps in total. On Lap 52, with all other cars still running, Casey Mears made an unscheduled stop in his #13 GEICO Chevrolet. The crew raised the hood and found the engine was overheating so bad that a radiator line had burst. The team took the car behind the wall for further examination, but never returned to the track, retiring with overheating issues. Three laps later on Lap 55, Hill returned to the track yet again, this time 52 laps down. If Hill managed to complete at least a quarter distance of the race, Mears would have been left with his first last-place finish in Cup since June 11, 2006, when his #42 Texaco / Havoline Dodge crashed after 1 lap of the Pocono 500. Unfortunately, on Lap 60, Hill’s car started trailing smoke and was black flagged for the final time. This time, Hill’s car was parked by NASCAR, ending his afternoon. NBC’s leaderboard officially listed Hill as “OUT” by Lap 94. With Mears and Hill the only official retirees, the Bottom Five included a couple surprises. 41st went to Clint Bowyer, whose #15 5-Hour Energy Toyota crashed after contact with Ryan Newman’s Chevrolet on Lap 127. The two made contact on the backstretch, sending Bowyer’s car hard into the outside wall before it backed into the inside retainer. 40th went to Travis Kvapil, who was making just his third start of the season and first for Circle Sport in the #33 Little Joe’s Autos Chevrolet. 10 laps down with Kvapil was Jimmie Johnson, who endured a miserable afternoon where his #48 Lowe’s Chevrolet spun three times, the last sending him into the grass and tearing up his front valence. *Hill becomes just the third last-place finisher in Cup Series history to be parked by NASCAR. The other two occurrences were due to single-car teams failing to bring pit crews to the track for race day: Joe Ruttman’s #09 Phoenix Racing Dodge at Rockingham in 2004 and Mike Wallace’s #64 Gunselman Motorsports Toyota at Pocono in 2009. *This is the first last-place finish for both Hill and the #98 in a Cup race at Michigan. Three strikes and Timmy Hill's last.